In our commitment to help you find products that can actually live up to their claims, we’ve come up with this list of the best concealers for eyebrows after spending more than 17 hours going through 20 different brands. The products that made it to our list were carefully selected based on ease of application, longevity and value for money. NYX Cosmetics Concealer Wand has a non comedogenic formulation that tends to last long on the skin. It's easy to apply and comes with an applicator that can help you achieve a more precise application. For a brightening effect, L'Oreal Paris Magic Lumi Highlighter Concealer is a good choice. It comes with a built-in brush applicator to help you get a more flawless result. Take note that this one only offers sheer coverage. Looking a bit similar to L'Oreal Paris Magic Lumi Highlighter, Maybelline New York Dream Lumi Touch Highlighting Concealer also comes in a pen packaging with a built-in brush. It has a hydrating formulation and offers a sheer to medium coverage. 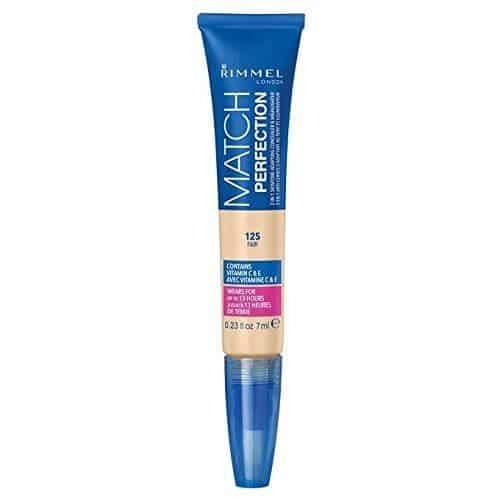 Also offering medium coverage, Rimmel Match Perfection 2﻿﻿﻿﻿-in-1 Concealer and Highlighter has a liquid formulation that dries to a soft matte finish. It can last for several hours after application. Anastacia Pro Pencil can give you precise application for your brows, blemishes and lips. You can also use it as an eyelid primer. Find out what our beauty editors think about the best concealer for eyebrows and how you can use them to achieve your brow goals. Infused with hydrators and skin conditioning agents, NYX Cosmetics Concealer Wand can make your skin look healthier. It comes with a wand for a more precise application. It feels emollient and doesn’t turn flaky. It’s noncomedogenic, too, which makes it perfect for almost all skin types. The product is very pigmented. You’ll need a teeny tiny amount for your brows with this product. It’s consistency isn’t too thick or too runny- just right for cleaning up the edges of your brows. Once set properly, it can practically last the whole day. It dries to a semi-matte finish. For its cheap price, this concealer is a really good buy. It doesn’t just work well on eyebrows, but it performs extremely well on dark circles and blemishes, too. L'Oreal Paris Magic Lumi Highlighter Concealer has a light formula to give your skin an added glow. You just need to dab it on areas that need a brightening effect. For this feature, you can consider this as the best concealer to highlight eyebrows. It comes in a metallic tube that looks high end. In reality, however, this one’s affordable. It doesn’t contain as much pigments so don’t feel surprised if its coverage is only sheer. However, it does have a bit of shimmer. The problem I have with this product is the limited shades it comes in. Although your purpose might just be for your brows, you still need to use a concealer that matches your skin tone- else, the result will look awkward. Its formula is thin and leans more on the watery side. This makes application and blending really easy. The concealer isn’t that moisturizing, but it’s not extremely drying, too. For this reason, I think this won’t work really well for those with dry and flaky skin. Maybelline New York Dream Lumi Touch Highlighting Concealer looks a bit like the product above. In fact, they look almost the same at first glance. One difference they have is their packaging. Maybelline New York Dream Lumi Touch Highlighting Concealer comes in a plastic tube and is a click pen. It is a gel-infused concealer which works to illuminate as it conceals. It can make your skin look a bit brighter. The nice thing about this product is that it’s noncomedogenic and dermatologist approved. These things make the product great for all skin type. The formula is moisturizing and can work well with those who have dry skin. It blends and spreads easily. The built-in brush can get dry at some point, especially if it has been saturated with too much product. A dried brush can make it hard to dispense and distribute the product well on your skin. This concealer is our recommendation as the best drugstore concealer for eyebrows. Rimmel Match Perfection 2-in-1 Concealer and Highlighter made it to this list of the best concealer for eyebrows because of its ability to, well, conceal and highlight. The product is pigmented and creamy. It’s easy to apply and blend, especially on the areas under your brows. It has a liquid texture and dries to a soft matte finish. As for longevity, I’d say this one can hold on up to several hours. Apart from how well it works, another thing I like about this product is that it comes in a squeeze tube. This can give you more control on how much product to dispense. One issue with the packaging, however, is its built-in brush. Apart from that it makes the product unhygienic, it can also cause product buildup which, eventually, can clog the tube. For a really precise application, go for Anastacia Pro Pencil. It offers a cream to powder finish in three different shades. It’s particularly made to conceal brow hairs as they grow. Apart from that, this concealer pencil can also work well on dark circles and minor blemishes, particularly since it offers full coverage. You can also use it as an outer lip liner. One trick to get the most out of this product is to warm it up first. Using it when it’s hard can cause tugging and pulling which are both bad for the skin. Another issue is that its tip need to be sharp to get a precise application. This means constant use of a sharpener or you can just swipe the tip on the back of your hand until it starts to feel flat. The product comes in three shades. It’s quite limited and won’t give you enough options, especially if you are looking for the best concealer for dark skin. Concealers on eyebrows? Uhm, why not? Concealers are no longer limited to covering blemishes and scars. They can also be used to accentuate your best facial features, like your eyebrows. The trick is to find the right shade of concealer. Unlike concealers you use to cover your blemishes, you need to pick one that is one to two shades lighter than your skin tone. Your purpose is to highlight and make your eyebrow area look more lifted. In choosing the right shade, you should also consider the color of your foundation. Even though you are going for a lighter concealer, it still needs to blend with the rest of your face. As for application, it’s best to start lining your brows from the inner edge outwards. Go as close as possible to your brows. Use a small angled brush or as small flat brush if you’ll be working on a liquid or cream concealer. For a pencil concealer, ensure that it’s sharp enough to hit the right areas. You can warm it up to avoid tugging and pulling. To avoid looking awkward, blend the concealer towards your eye makeup. The transition needs to be smooth to avoid making your eyebrow area appear too light. Similar to most concealers, you can also set the product on your brow area for longevity. Using concealers on your eyebrow for the first time can be nerve-wracking. That’s quite understandable as most of us have been conditioned to use concealers for hiding blemishes and dark circles. Concealers for eyebrows, however, offer a handful of advantages. They can make your eyebrows look cleaner even if you failed to pluck the stray hairs. They can also highlight and make your brow area look more lifted. For these exact benefits, we want to make sure that you only get your hands on a product that can actually deliver. For us, the best concealer for eyebrows is NYX Cosmetics Concealer Wand.